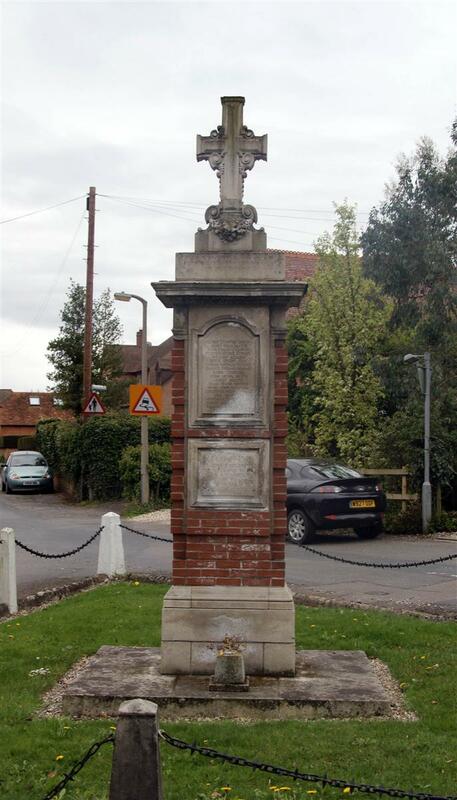 Speen War Memorial – Dedication Service, 14 Aug 1921. "To the Glory of God and in Memory of the Parishioners of Speen who gave their lives in the Great War, 1914-1918." The architect was Mr W A Forsyth of London, and the work of erection was carried out by Mr E B Hitchman, of Newbury, the carving and lettering being executed by Mr Blair of Eton, and Messrs Thorn and Sons, Nebwury. The cost of the memorial has been defrayed by parochial subscriptions, the arrangements being in the hands of a committee, of which Mr Thomas Dreweatt was the secretary, and Mr Francis Gibbs, the chairman. On Sunday, prior to the service and ceremony of unveiling and dedication, the monument was shrouded by a large Union Jack, whilst a group of plants from Speen House adorned the base, which waz also encircled with laurel leaves and ivy. Parishioners attended the service in large numbers, there being also several from the neighbouring parishes of Stockcross and Donnington, and many people besides, all of whom, no doubt, attended with feelings of pride, intermingled with sorrow. The ceremony began with the sounding of the "Fall in" by Drummers F Davis and H Parmenter, of the Royal Berkshire Regt, and a procession made its way from the Parish Room to the memorial. At the head was the Rev Reginald Gibbs, MA, Vicar of Clifton Hampden (who is the son of the late Rev J Lomax Gibbs), and the Rev J G Hooton, who were followed by the Vicar of Speen, Rev R Bruce Dickson, Major-General Mahon, and Mr T Dreweatt, with a number of ex-service men belonging to the parish in the rear. Addressing thise present from a platform, Major-General Mahon, CB, CSI, who was wearing medals of the South African and other campaigns, he having taken part in the Siege of Ladysmith, said he had been honoured in being asked to unveil the memorial to the nineteen members of the parish of Speen who gave their lives for their country in the great cause. He would first like to congratulate them upon the admirable site they had chosen for the erection of the memorial. He would like to see every monument to the Fallen placed in the most public thoroughfare of town or village, for then each chance passer-by might gaze upon it, and, if he or she would, might pause a moment and reflect on what it stood for. These things meant more than a simnple memorial to the dead, for they were the symbol of the grat cause for which they gave their lives. Throughout England, Scotland, Wales and loyal Ulster, throughout the great dominions of Canada, Australia, New Zealand, South Africa, the great dependencies and the hundred Colonies of the Empire, in every clime, on every continent, where loyal citizens honoured the King, and gloried in being individuals of the great confederation, throughout all those places memorials had been, or were being raised to commemorate the names of over a million dead. Round all these memorials had gathered mournful and many sorrowing hearts. The legions of dead soldiers looked for peace and dreamt of it. The looked forward to their home-coming, but in one thing they were steadfast, and that was that there would not be peace unless it was gained through victory. But the fell before the peace came. And those present that afternoon were the heirs of the peace for which they fought and died. Were they worthy of their sacrifice? The service they were then holding, solemn though it was, was not the only thing that they could do to bring into actuality what those brave men laid the foundations of. Many things had been done, and were being done since the war, which those men would hardly have approved of. But turning from reflections such as those, was it not within the scope and power, in every country parish, for them as individuals to teach the children in their schools to venerat the Empire, and to fear God and honour the King, as was written in every ship of His Majesty's Navy. When he was on a mission in Canada, he found that every child there honoured and loved the Mother Country, whilst the flag was hoisted in every school during lesson hours. Why was it not done in England? He did not desire to speak in approbation of the German code of ethics, but in Germany every child was brought up to revere and esteem the Empire as soon as it was able to lisp. Theirs was an aggressive patriotism, and not to be recommended. He thought that some annual little ceremony, in which the school children should be gather around this memorial would serve to keep green the memory of the great deeds for which these men gave their lives, even in the time to come, when their kith and kin had passed away. In England, there was no organisation that tended to honour more the men who fell in the Great War than the Boy Scouts' movement, which had been inaugurated by the genius of one man, for that movement fostered love of country, encouraged the honouring of the Sovereign, and created rectitude of character. Why was it that Great Britain and France, both unprepared for the war, gained the victory over a foe so well equipped and strong, that it seemed at one time that it would dominate the world? It was unity. The men fought shoulder to shoulder, there was not thought of self, no looking behind, it was the "team spirit," which football players know so much about, that brought them the victory. And it was thaqt same team spirit, that pillung together, which alone could bring to maturity the fruits of the peace which those legions of galant dead made possible. General Mahan then released the flag, and the memorial was disclosed to view, after which it was dedicated by the Rev R Gibbs, and appropriate prayers were offered. Before announcing the hymn, "When I survey the wondrous Cross, the Rev Bruce Dickson thanked General Mahon and the Rev R Gibbs for the duties they had performed, and made a few remarks emphasising the need for people to live for others and not for themselves in order that happiness and peace might prevail. God's restraining hand had saved them time after time from defeat, let them live for the honour and glory of God. The hymn, "O God our help in ages past," was then sung, the organist being Mr C G Biddis, this being followed by General Mahon reading out the names of the Fallen slowly and impressively, the Doxology and the Blessing, the service being fittingly concluded by the buglers sounding the "Last Post." A number of floral tributes were subsequently placed at the foot of the memorial, and as the people turned away, a muffled peal was rung on the church bells.